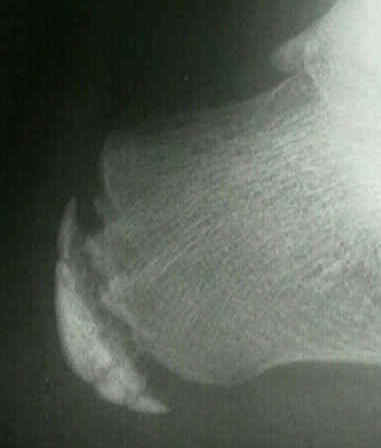 Underlying anatomy: This is a condition that affects the cartilage growth plate and the separate island of growing bone on the back of the heel bone. This growth plate is called the physeal plate. The island of growing bone is called the apophysis. It has the insertion attachment of the achilles tendon, and it has the attachment of the plantar fascia. This island of bone is under traction from both of these soft tissue tendon and tendon-like attachments. The causes of this problem: Mechanically, the heel takes a beating. And the apophyseal bone is located near the point of impact for the heel bone at heel strike and with most weight bearing activities. This includes running, jumping and walking. In addition to this, there is traction on this apophyseal bone and the associated physeal line of growth cartilage. This traction on the apopysis (island of bone) along with the impact of weight bearing activities can lead to inflammation and pain. Tight Achilles and calf muscles also can contribute to this problem. Heavy impact activities like soccer, football and gymnastics are commonly associated with this problem. I have seen this as early as with 8 year old boys and girls and as late as 14 year old teenagers. Additional factors: Having flatfeet or very pronated feet can make one prone to this mechanically. But also patient's have a very high arch foot structure tend to have a very high shock and high impact heel strike. This also puts extra stress on the heel and apophysis. Symptoms typically include heel pain related to sports activities and worse after those sport and exercise activities. But, some children who are not in a sport may also get this if they are physically active. The pain is usually on the back of the heel, the sides of the heel, the bottom of the heel, or a combination of all of these. We typically don't see swelling with this. Sometimes the pain is so bad the child will have to limp, or take a break from sports activity either for a few days or few months. Diagnostic evaluation: This can include physical examination and x-ray evaluation. It is rare to require a CT scan for this. X-rays may show some increased density or sclerosis of the apophysis (island of bone on the back of the heel). This problem may be on one side or bilateral. Treatment: Involves a combination of rest, modified activity, anti-inflammatory treatments, shock absorption and support. In many ways, this is treated quite similar to adult plantar fasciitis. And in some cases there can be some inflammation of the plantar fascia. But this is not a typical finding. Rest: If the problem is bad enough, it is important to totally rest the symptomatic foot. Over-the-counter anti-inflammatories or as recommended by your pediatrician or podiatrist. A significant and/or chronic case should be treated with prescription orthotics. This addresses mechanical problems that cause this problem. A night splint will also help this. Respond best to prescription orthotics with specific modifications for this problem. There are special daytime braces that may also help this. At our clinic we are usually able to get our patients pain free within several weeks. Read our other post by Dr. Brandon Nelson about Sever’s Disease.